Lee Stanton and Dirk Krause have been seeing each other for a couple of months when they get the bad news: the firehouse they work at will be closed unless they can come up with the money to complete some maintenance and repairs. The union wants to stand and fight. There’s just one problem: the only suggestion for how to raise the money is Lee’s. And Dirk hates it. Great addition to the series...love seeing Dirk and Lee's relationship grow. Loved it, terrific story with a beautiful ending. 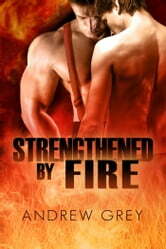 Great if you love hunky firemen and a story of hope and devotion. I love dirk and lee!!!! Their relationship is amazing and the whole story was awesome! A great read!! Same content as the first book! Please fix. I was going to read this second book but everything was the same content as the first.